The property was just as described. Clean and close to everything. P er fect for my trip. Mahalo, Donna, for the wonderful review! Hope you are able to plan a return trip soon! Very good. Property manager provided orientation on unit, access and all important information. Fob and key code door lock was easy to use. Parking was great and easy to enter and exit. We did have an issue with some condensation water puddling in the floor from the refrigerator that I texted the manager about but never heard back. It happened randomly 3 different times and we easily wiped up the water but really does need to be checked! Although we were up on 12th floor, noise from below was pretty audible and may suggest better sound proof sliding doors. It did get noisy on occasion in the early mornings. Mahalo, Wendy, for sharing your comments about your recent experience at Marine Surf 1204. We are delighted that you enjoyed your stay and that you appreciated the convenient key-less locks and free parking. We apologize for the issues you encountered with the refrigerator, thank you for alerting us and we are sorry that your text was not answered in a timely manner. The property manager has replaced the drip pan and the water problem is resolved. Thank you for choosing Captain Cook Resorts and we look forward to your next visit. This unit was very much as advertised. Very central and convenient. Waikiki is very noisy at night - bars empty at 1-2 a.m. and there is much drunken yelling. The garbage removal trucks start about 4 a.m. and make a **** of a racket for over an hour. Canadians be warned - when we paid our first installment by credit card we were charged an extra VRBO fee of $84.00 US on this property - never before have we had to pay an added fee like this on a VRBO. Mahalo for posting a review of your stay, Elizabeth. We're glad you enjoyed your stay! 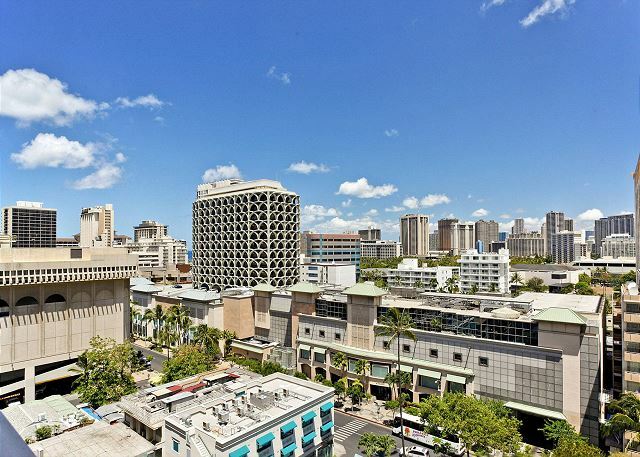 Yes, Waikiki can be a noisy little town and you may find the higher floors quieter, or using the air conditioner quiets things down. Actually, VRBO has been including a service fee for over 2 years now. It is shown in the quote with a question mark beside it. Mahalo again! Decor very pleasant and clean, all necessary appliances, utensils and items for beach were there. Captain Cook were extremely professional & helpful. Would definitely stay there again. The location and accommodations were exceptional. We will book with Captain Cooks in the future. James greeted us on our first day. I asked to check in early, and the apt was available so I was able to. The place was clean. I liked how thenapt had kitchen and cooking utensils. Laundry detergent. Cleaning supplies for dishes and new sponge. The AC worked well and the lanai was helpful when drying out swimming gear. They also had an iron and ironing board. Boogie boards and beach chairs to use. Free parking with the condo was very convenient. It’s a tight parking spot & entry way- no large vans or SUVs will fit. The bed is starting to get really dented in, so maybe a new bed soon. A larger TV would be nice as my husband was watching the NBA playoffs the wk we were there. Mahalo for choosing to stay with Captain Cook Resorts and the great review and recommendation! We're so glad your visit was enjoyable and thank you for alerting us about the missing beach chair. Had you notified us immediately, we would have provided you with a second chair right away. In the future, please remember that the property manager is there to resolve any issues that may arise during your stay. We look forward to seeing you again on your next visit. Great location, everything supplied except it needed a broom, windows/Doors need to be tinted as room facing the westerly sun, up-date air conditioner very noisy, saying this we had a great stay. Nice clean and tidy unit, everything needed inside. Can get super noisy if a night and the sliding door is hard to open, but that wouldn't stop me from coming back. Mahalo, We appreciate the positive feedback and will look forward to your next visit! The unit was clean and looked exactly like the photos. The unit had everything you need for the kitchen, travel size shampoo/conditioner, beach towels and even beach accessories. 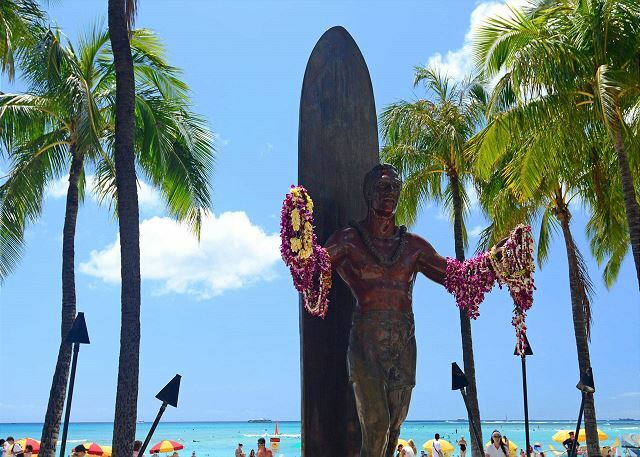 The location is great with several food options and Waikiki beach within walking distance. Parking was included which was a huge plus (a little maneuvering required when cars are parked in the spaces around the spot). The chairs and table on the lanai were a little rusty. Overall, we were satisfied with our stay and would stay there again. Mahalo Saori, for taking the time to share your recent experience at Marine Surf 1204! It's always great to get this kind of feedback - we're so glad you enjoyed your stay! We look forward to seeing you on your next visit! This property was in a good location for all activities. Property was well maintained and a great spot for my wife and I. I definitely recommend this. Mahalo for the great review and recommendation! So glad to hear you enjoyed your stay in this great condo! We look forward to your next visit! This is the second time we have stayed at Marine Surf and were very happy with our studio apartment. It was supplied with every thing we needed, with even some extras we didn't expect. We love being able to walk to most everything, and found people to be very friendly in the building. We would certainly stay there again. Mahalo for the 5-star review, Carleen! Happy to have provided all of the needs you required for a wonderful vacation! It's what we're here for! We appreciate your return business and look forward to your next vist! I'll pick this place again. I walked to the beach a little, but I can go that far enough. (I mistook it with two places. This is not Waikiki Park Heights where bathtub water goes down. Mahalo, Jlyoon! We appreciate the feedback and will look forward to your next visit! Room was nice and clean for the most part. Great location. Free parking was a big plus. Some condensation from a higher units' air conditioner caused water dripping onto our lanai which was annoying but not a big deal. Mahalo Mason, for the positive comments and recommendation! We hope you’re able to return for another visit soon! This is our 2nd time at Captain Cook's Marine Surf unit. The location is quite good. Short walk to Waikiki beach and evrything! Parking is free and the spot is always available only for you 24/7. The neighbors who are local people living in the same building were quite friendly too. We only have a problem with the drainage clogged in bathtub since the firstvtome using it, but we solved the problem ourselves. Just buy a Drano from a supermarket and the clog was all gone. Everything else was wonderful and we had a great stay at Marine Surf 1204. Mahalo, Asada, for the great review! While we're happy to hear you were able to resolve your drain issue, a quick call to our property manager and we could have taken care of the issue for you! It's all good. Hope you are able to plan a return visit sometime soon! You Should Stay Here!!!! Everything Was Great! It was easy to find and easy to book, it was affordable, the customer service was great, the experience of arriving and having the property manager meet you there was great. The apartment was just how it looked in the pictures, it had everything we needed, it was clean and in a great location, also liked that it was very secure. All around a great experience, if/when we come back to Hawaii, I would want to stay here again. Mahalo, Jessica, for the great review! Hawaii IS affordable and we're so glad you enjoyed your stay! Welcoming the property manager was very good and very nice, thank you Jessica !! The studio was consistent with the photos, it's just perfect. It is clean, well placed and very well equipped (equipment for the beach, cleaning products, engineering washing the floor, AC, etc ...). Free wifi and free parking are also great benefits! My 9 year old niece called the studio "our house of happiness." The only area for improvement is the management of pass upon check (block lift to remove the pass) but I think you will soon do the needful. I also think we should make a checklist to give to visitors to give them the necessary information to the living room (upstairs to the pool, where to take the garbage, how the washing machine etc ...). Thank you for our wonderful Captain Cook holiday week! Mahalo for sharing your comments, Stephanie! You're welcome to come back to your "house of happiness" any time! Excellent accommodation. Great way to feel at home away from home. Perfect location with parking. Great management. Immediate response in case of any questions. Definitely will recommend to our friends and hope to stay there again. 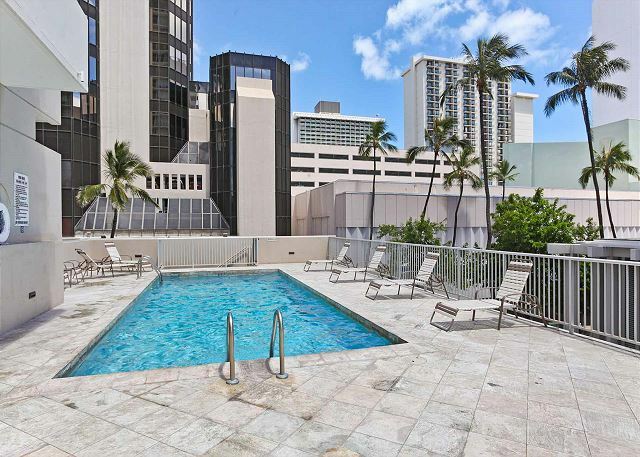 Beautifully presented apartment with an Ocean view glimpse which was perfectly located in the heart of Waikiki. The apartment provided everything one would need and was well maintained with pay it forward sundries provided such as laundry credits and liquid. Captain Cook staff we very friendly and helpful and provided a great service. Mahalo, Michelle, for the positive comments and recommendation! We work hard to offer great accommodations and service, and we're so glad your stay was enjoyable. We look forward to seeing you on your next visit! Stayed for a week and was happy with the condo. Great location and security! The condo had everything I needed, except for a duster pan and a fan broom, but I did fine cleaning the room when I needed with what was available. The only complaint I have is the noise from outside and my neighbor. You can hear the neighbor opening and closing either a closet or the sliding door constantly. The garbage truck comes at around 5:30am and you can hear the beeping from it. Other than the noise, I was very happy with the condo. For a few nights it's ok, but longer stays need a comfortable sofa to sit, and a table with chairs when you have company for dinner. Also, bed sheets that actually fit the bed. Mahalo for posting a review of your recent stay. Our goal is to do all we can to earn your repeat business. Due to their size, studios are probably not best suited for entertaining - perhaps a one-bedroom condo on your next visit? By chance did you notify your property manager about the sheets during your stay? Her name and number are prominently displayed in the condo along with the request, "If you’re not satisfied with your accommodations, please let us know right away so we can make it right!" We rented this property for a week. The property was close to everything, beach and all kinds of shopping and eateries. The place was clean with all newer appliances. Our first visit to Waikiki but not our last! We enjoyed our stay at the Marine Surf our rental had everything we needed for our stay. Loved the location close to everything. We Rented this property for a week. The property was close to everything, international market, beach and all kinds of shopping and eateries. The place was clean with all newer appliances but an old stove which worked Fine just didnt fit the rest of the suite. We will be renting this suits again next year for the Honolulu marathon!! Cant wait Miss the place and weather all ready!! Overall a very nice stay in a top notch condo. Great location with everything you need! This is our third stay at the Marine Surf! We love the central location and great value for money. Not the flashiest place in Waikiki but you're not paying for it either! Highly recommend to those looking for a great home away from home!! Our time with you was not long enough.We'll be back. 1. The basics were clean (toilet, bathtub, sinks, fridge), however the apartment was very dusty. There were food crumbs between the stove and cabinet that should have been cleaned by now considering everyone pays a cleaning fee. The floor needed to be washed also, but it wasn't filthy. 3. It may be too loud and bright for you to sleep if you are from the suburbs or a rural area. We live in a city and are used to sirens, garbage trucks and street lights. 4. This is a west facing unit, which means it gets very warm in the afternoon/evening. We just had the AC on the whole time, and it was fine. 5. The building doesn't recycle - everything goes into the trash. We only hope it gets sorted later. 6. The pool is actually bigger than it looks in the photo. There is no wading section for kids, but our 3yr old didn't mind just being held the whole time. The Pictures describe it very well. 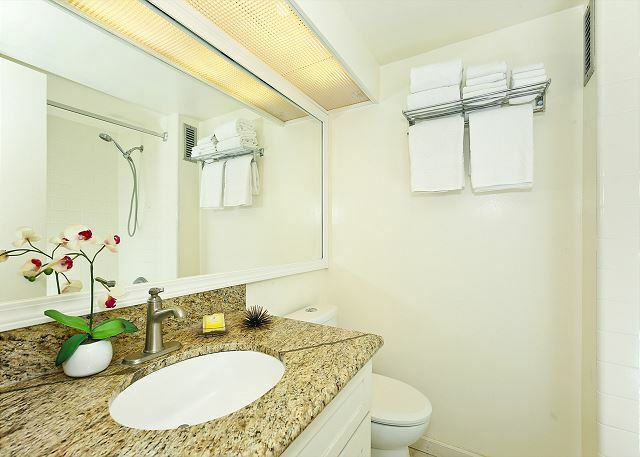 Comfortable and has everything you need for a stay. The building is conviently located and while it does have a pool it is not worth using, but who cares the beach is 2 blocks away! The pool is great for a quick dip to cool off. It also has nice chaise lounges for working on your tan or reading a book. The location was super, but the cleaning was not ok.
We had to pay $110.- cleaning fee, but that is too much for such a bad cleaning. The bed-bath and toilet were clean, but the rest was very dusty, we found dirt between the oven and the kitchencounter and we found cockroaches. The oven was so very old that we did not use it. There were holes in the curtain. The advertisement is talking about freshly painted and that is right but the condo has to be renewed. New curtains are on order. Room was checked and treated for insects. Could not find any evidence of infestation. Although the stove is a little old it works perfectly fine. This room was remodled with new flooring and kitchen less than a year ago. 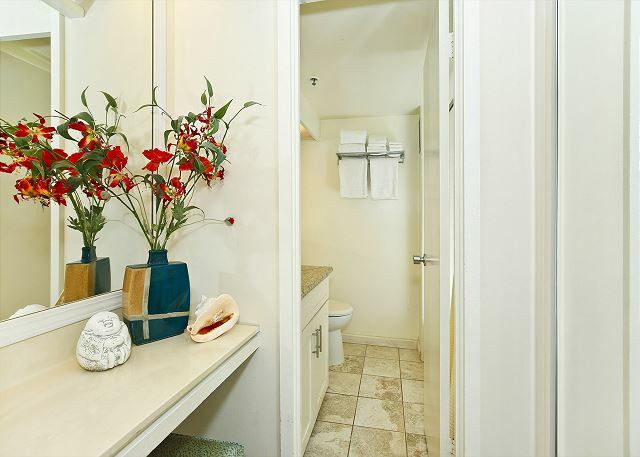 All of our condominiums are meticuously cleaned by our professional staff before our guests arrive. If we would have been contacted, we would immediately remedied any cleaning discrepancies. This was our second time in this condo. It has been upgraded to a nice standard. Will stay here again. The unit was very clean and comfortable for my one month stay. Looks as though it was recently renovated. Completely functional and well appointed full kitchen was a plus. Older green stove sorely stands out...but it works. The room has a cozy feel to it though there is a fair amount of seating avail. It has a small patio with seating for 2, nice closet space, even has a nice seated vanity mirror space. Laundry center was close and convenient. Unit is in an excellent location within short walking distance of the beach, shopping areas, and plenty of nightlife. The street noise can be a little loud at times, but that's the price you pay for being close to the main partying area...popular club across the street...with many other bars a short walk away. Building is secure and you get an assigned parking spot a major PLUS! as some hotels charge up to $40 a day for valet parking. My only negative was the building has a bug issue. Not a major one but the occasional roach or two will be seen. Though the building does look well maintained and clean. The check-in and out process was simple. Had no issues with the unit so I never interacted with the unit manager other than to check-in. This unit has since been treated for roaches. Great place...centrally located... walk downstairs and find places to eat & shop. the studio was perfect for me! Came with a parking spot too! Definitely would recommend this place. There is nothing but positive things about staying at Marine Surf! The management staff were excellent! There were accommodated a few requests and were available to help with everything. The location was amazing! A few blocks to the beach but only steps way from the International Market and other dining and shopping. The property was clean and well maintained. The Property was well equiped with dishes, towels and an extra set of sheets. The only thing that was a concern to us was that the bars on the lanai were far enough apart for our 1.5 year old to get her head through. Although this apparently was to code, it is a concern to anyone staying there with little ones! Amazing place to stay and enjoy all Honolulu has to offer! Paul greeted us at the lobby and explained about everything to us and he also set up our wi fi for us - very helpful. Our first day we discovered that the toaster did not work and that the hair dryer was missing, Paul replaced these items right away. We also discovered little black bugs in the kitchen, so we kept our food stuff in the fridge. The first week our neighbours in 1202 had a TV on the Lanai and would watch it at night 1am to 5am we complained about this to the office in the lobby and they corrected the problem. The price was great for the month, the only other thing is that this unit could use some updating. If I would have known about the little black bugs, I would have taken care of it right away. The room has since been treated. Our stay was quite pleasant at the Marine Surf and would stay there again. Close to everything, clean, quite, and great rental agents. 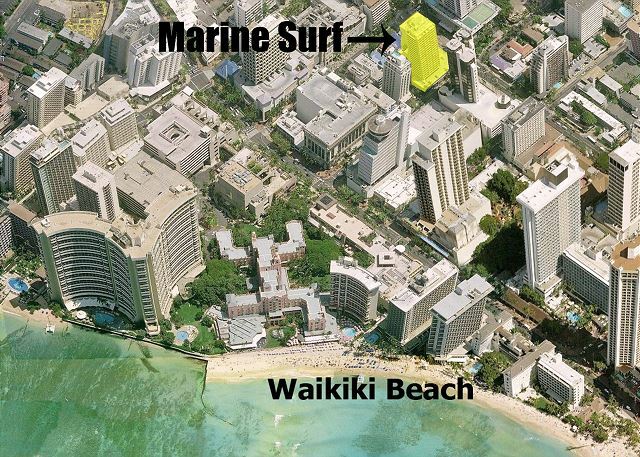 My wife and I spent a week at the Marine Surf Condominiums in Waikiki. The condo provided us with a great place to stay as we spent time all over the island during the week. Check in was easy, and Paul Tucker of Captain Cook showed us the room and told us about what was available to do on Oahu during our stay. He was very helpful and friendly. We had no issues during the stay. The room was clean and nice. It is located just a short walking distance from the beach, shopping and restaurants. We would certainly recommend this property to anyone who wants to stay in a nice place in a good location at a very affordable price. I can't mention enough how friendly and helpful Paul and the cleaning staff were. Thanks for helping us enjoy a great first visit to Hawaii. We plan to return soon. Service as excellent. Room clean, neat and nicely furnished. 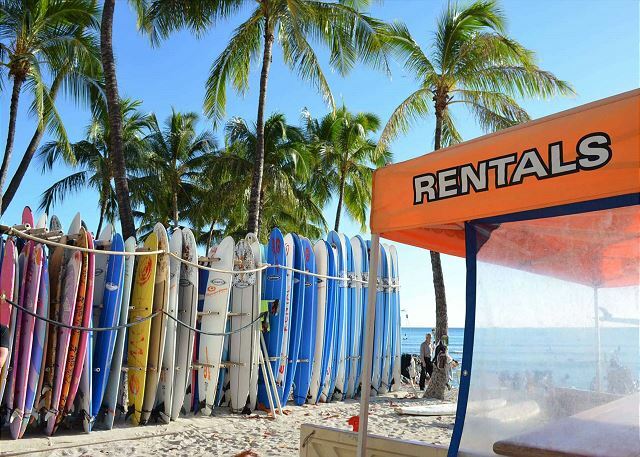 Have rented vacation rentals on Oahu twice yearly for three years.